A critical part of creating fiction is a careful examination of the world. Storytellers, first and foremost, must be students of the human experience. We have to spend time learning about what motivates people, how different personality types tend to form and respond to situations, how various societies react to different stimuli and challenges, how the setting we all share (the earth) responds to our existence. Sometimes this intense study leads to forecasting rather than fiction. Here are three inventions by famous authors that look like they will definitely come true–for better or worse. #1. Meat won’t come from live animals. In her book, Oryx and Crake, Margaret Atwood writes about chicken that is grown in parts by machines. Her ChickieNobs don’t have eyes or beaks, though they have a mouth-like orifice for receiving tubes of nutrients. It’s meat without the animal. Such “nobs” are not a reality–yet. But since the 2003 publication of her book, “cultured meat” has been cloned from the muscle cells of beef cows. 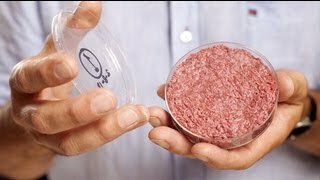 The process isn’t exactly like the blobs with tubes sticking out of them that Atwood envisioned, but when you hear about the “tubes” of muscle tissue that are grown and stacked to create one of these burgers, she doesn’t sound far off. Personally, I’d like to eat protein that doesn’t involve killing a living creature. But, I wouldn’t want the dystopian future of genetic engineering run amok that Chickienobs is created in. So I hope Atwood’s prescience only extends to our food. #2. Ads will know what I’m thinking Thanks to trading my privacy for a host of “free” and inexpensive services, like Web email and online-connected intelligent speakers, corporations can easily collect a lot of data about me. Right now, they don’t seem to use it for much more than delivering Web page ads about things I have Googled, mentioned in emails, or asked “Alexa” about. But, according to Matthew Tobin Anderson, writer of 2002’s “Feed,” eventually I’ll get such personalized ads directly into my head. In Anderson’s fiction, the ads are delivered by an implanted chip in my brain. In reality, I think, facial recognition and biometric identification will advance to the point that nearby computers will simply be able to link who I am–based on what I’ve touched and my face–to an advertiser profile formed from records of my online interactions. My personal ads will appear on the nearest available screen. Given advances in virtual reality, that screen might very well be right in front of my eyes in the form of some Google Glass-type device. 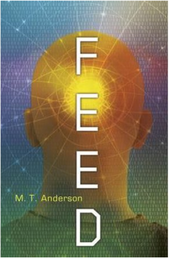 And, in my opinion, such a “feed” directly in my line of sight isn’t so far off from a brain implant. #3. 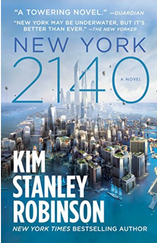 The Great Flood Will Come… To Manhattan This prediction from Kim Stanley Robinson’s New York 2140 is one of the most heartbreaking for me personally as someone who lived in NYC for a decade and now has a house in the suburbs about a mile from The Hudson River. But I believe it. Water levels are rising. The world is most certainly getting warmer–even if President Donald Trump remains skeptical as to the cause. I’ve also seen The Hudson overflow its banks before. During Super Storm Sandy, I had to take my then baby to the second floor of my waterfront condo because the waves of water were coming dangerously close to the elevated first floor windows. Somehow, I didn’t flood. But neighbors on the ground floor lost their apartments. (And, yes, I should have evacuated like I’d been warned instead of just moving the car to higher ground and hoping for the best). Robinson’s predictions are particularly dire–a NYC under water creates for a better story than one slowly eroding beneath the river. But I’d bet that a future in which Manhattan is dealing with a flooded sea port and financial district isn’t too far off.